Comply™ Foam understands the science of sound. We’re committed to perfecting how you hear music when you’re on-the-go, which means ensuring you hear precise highs and deep, thudding basses no matter what’s happening outside your earphones. And whether you’re pedaling your way across your daily commute or hitting the gym to get in some heavy lifting, Comply has made the premier earbud for the athlete in you. Comply™ Foam’s Sport Pro 600 Series earphone tip replacement is about to bring your music listening game to a whole new level. Listen up as each earbud tip is engineered to deliver maximum sound while staying put no matter how much you start to sweat. Popular earphone brands compatible with 600 series earbuds include 1More, Erato, Murel, Plantronics - BackBeat GO 3, SoundPEATS and more. These brands produce some of the highest-quality audio tech available—why compromise high-fidelity sound with shoddy eartips? Stop leaking sound and start locking it in. Hear the music for what it’s worth and get the most out of your finely tuned earphones. Superior Comfort Meets Superior Fit: Standard one-size-fits-all earphone tips simply don’t make sense. When you plug them in, they may stay in your ear, but they won’t stay there for long. Your rough-and-tumble workout will have them slipping out time after time. Plus, a poor fit will have you losing valuable sound and drowning out the music with the noise around you. You have better things to worry about than pausing a run to put your earphone back where it should be. Our extensive research has revealed that each ear canal is different. The shape and opening of your ear canals change as you open and close your jaw, plus it varies from individual to individual based on their weight, age and level of hydration. With so many variables factoring into your individual ear canal shape, it’s no wonder that a standard silicone rubber earbud tip just doesn’t cut it. We’ve revolutionized earbud tips. Our patented viscoelastic memory foam expands and adapts to your specific ear canal, dramatically increasing in-ear retention no matter what the workout is. Since our body-heat activated memory foam is 30x softer than the silicone tips you may be used to, you don’t have to worry about listening fatigue and aching ears. Anti-slip Grip with SweatGuard™ Technology: Integrated SweatGuard™ technology places an acoustically transparent filter inside the tip of your earbud. You’ll be locking in the same great sound while keeping out sweat, moisture and debris like earwax. If you love high-quality sound as much as we do, odds are good you invested a lot into your earphones. 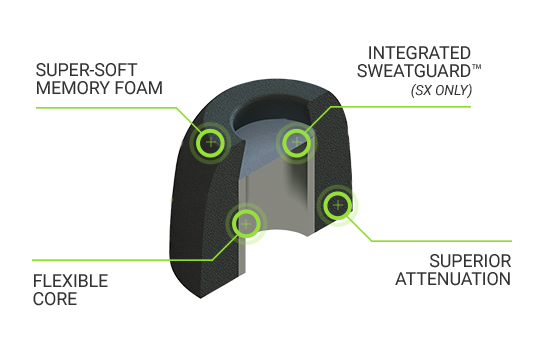 The protection offered by SweatGuard™ means they’ll last longer and sound clearer, which is exactly what you want. Plus, these memory foam earbud tips offer 600% better grip than silicone. How’s that for a tight grip? Get Lost in Your Pump-up Jams: A snug fit and sealed ear canal means premier sound isolation. A flexible core couples with superior attenuation to fit your ear while funneling clean, crisp music directly where it counts. With a 10x thicker design than standard tips, you’ll be able to enjoy more music and enhanced sound at lower volumes than before (your eardrums will thank you).